Can You Hear Me Now? – Kenwood Two Way Radios – BioShine, Inc.
Communication is key this day in age. With school shootings continuing to rise at alarming rates, you want to make sure your staff can communicate effectively in case of emergencies let alone on a regular basis. Whether you are custodial staff, emergency crews, construction workers, road crews, or any employee who needs to be able to communicate with others for job safety, project effectiveness, or emergency situations, Kenwood Radio has you covered. With the advent of cellular phones, many believe the two way radio has become extinct like the dinosaur. However, this is just not true. I don’t know about you, but my cell phone does not get a good signal or signal at all in some hospital buildings, basements of buildings, middle of schools, etc. The signal on a cellular device does not travel well through concrete walls creating a lack of ability to communicate. UHF Two way radios fill the gap effectively. Let’s take a look at what Kenwood has to offer. In the world of two way radios there are UHF (Ultra High Frequency) and VHF (Very High Frequency) transmissions. For the purposes of the Janitorial industry, we would typically use UHF. UHF frequency waves are smaller and can travel through walls easier. Therefore, it is used in buildings, cities, and urban areas. VHF frequency waves are larger and more used for open areas like fields. Kenwood’s two way radios, up until the end of last year, still only had 4 channels to communicate. Now they have beefed up their radios to a 16 channel system. Not only do you get better coverage, but you also have the ability for customized programming. It’s like going from basic cable to premium cable, more channels with nothing on them. Not all Kenwood two way radios have the option to be operated in analog or digital. If you plan on converting your older radio system to Kenwood and your current have a different brand, you can purchase Kenwood radios as your current radios die out. In this case when operating two different radio systems, purchase the NX340U16P or NX340U16P2 and use analog so all radios could communicate. If you are only using Kenwood throughout your system, you can purchase any unit and use digital communication. What is the difference between analog and digital? Well, I’m glad you asked. Think of analog as when you are on your cell phone and your signal starts to die out, the other person can hear bits and pieces of what you are saying and sometimes with static or white noise in the background. Digital is a smoother communication, however if there is an interruption in signal you won’t hear anything. There is no static and no bits and pieces. It’s great quality or nothing. So what is the best on the market today? The two most popular models in our industry are the TK3400 and the TK3402. The only major difference between these two radios is wattage/coverage. The TK3400 is a 2 wat radio with limited coverage (up to 20 floors and 250K sq. ft.) and used for smaller facilities like elementary schools, small rehab or assisted living facility, etc. The TK3402 is a 5 wat radio with better coverage (up to 33 floors and 370K sq. ft.) and used for larger facilities like larger High Schools, Colleges, Hospitals, Hotels, etc. Kenwood has decades of expertise in sound quality which has allowed them to develop a 36mm diameter speaker with 1 watt output. With this in mind, your staff can hear instructions clearer, louder, and uninterrupted. Both units boast a lithium ion battery capable of 22 hour operation, water and dust resistance, and have a compact design. Click here for a brochure. Cost, cost, cost. Yes we all want to know, ok it’s so great but what about the cost. Well I have never seen a company give back to their customers as Kenwood does. They really give back to the end user on a regular basis with fantastic rebate programs. Right now through March 31st, 2018 they are running yet another rebate for customers to save money. If you invest in Kenwood, they will invest in you. 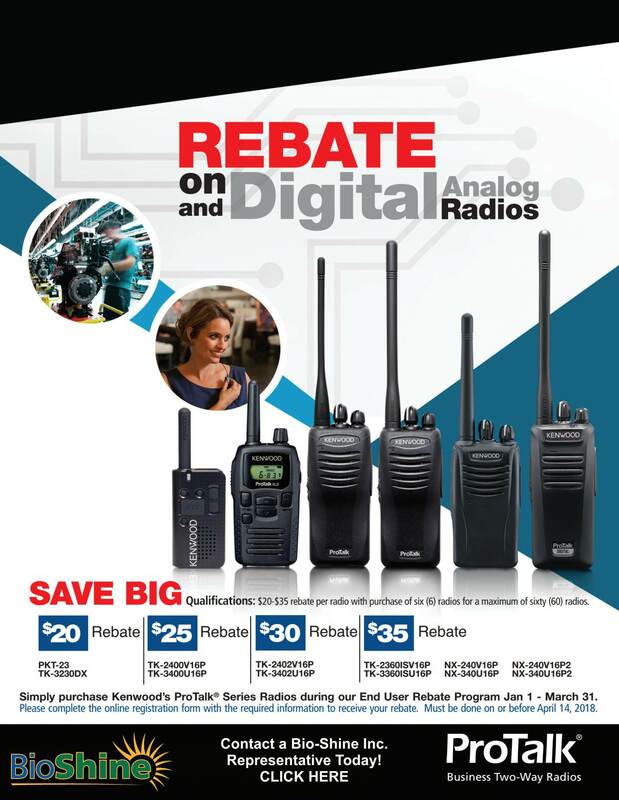 Click here for rebate information. If you would like to start changing over to the Kenwood two way radios or just need to upgrade your current Kenwood pieces, feel free to click here and contact us today. A professional is here to help. Next Next post: Robotics, Are We There Yet?